The German city of Wiesbaden removed Wednesday (Aug 29) a temporary statue of Turkish President Recep Tayyip Erdogan set up in a town square by artists, after it sparked confrontations between his supporters and opponents, AFP reports. 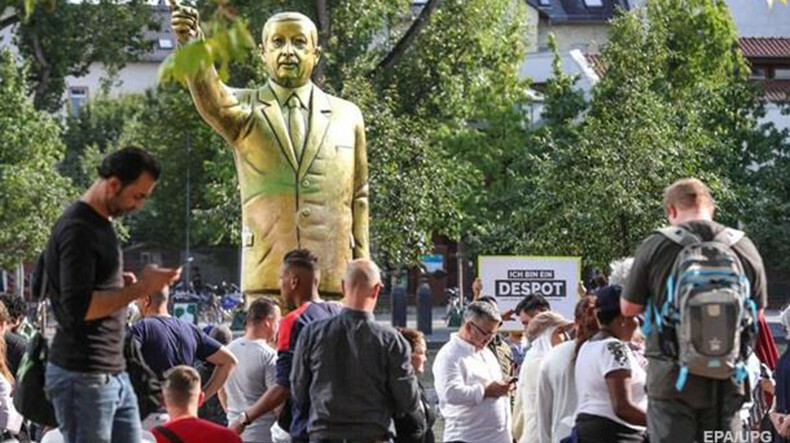 Firefighters arrived shortly after midnight with a crane to lift the four-metre tall golden effigy of Erdogan from the central German Unity Square, where it had been placed on Monday as part of Wiesbaden's Biennale art festival. Since a failed 2016 coup attempt in Ankara, Erdogan's crackdown on political opponents and journalists - including some German nationals - has been closely followed in Germany, home to a sizeable Turkish minority. A map of Armenia displayed at a community event in Germany caused a stir in the Turkish media. The map of ancient Armenia with boundaries covering Cilicia and Western Armenia was presented during the event. This map also covered the territory of the self-declared Turkish Republic of Northern Cyprus. Turkish President Recep Tayyip Erdoğan disputed the Armenian Genocide after a question from a journalist during a press conference at the G20 summit in Argentina, Armenia News reported on Monday. Erdoğan about the rights of minorities in Turkey by A journalist who described himself as an Armenian descended from people who faced genocide, Erdoğan said the question should be left to historians. "It is impossible to say that Turkey carried out a genocide," Erdoğan said. "A total of 100,000 Armenians live in our country. They were never discriminated on the basis of citizenship, we have never deported any Armenians because of their nationality. We are very humane in our conduct, and we will keep on doing so." Referencing Article 301 of the Turkish Penal code, which allows prosecution and imprisonment of intellectuals and historians speaking about the Armenian Genocide, Erdoğan's response was cynical, according to the Armenian National Committee of South America. Article 301 is a controversial article of law under the Turkish Penal Code which makes it a crime to insult the "Turkish Nation". According to PEN, the international writers' organisation, Article 301 has repeatedly marked writers, journalists and publishers out as targets for attack, making it even more urgent that this law is repealed. The Turkish-Armenian writer and editor Hrant Dink and recipient of the 2006 Nobel Prize in Literature Orhan Pamuk were charged under Article 301 for "denigrating Turkey" and "insulting Turkish identity" for referring to the 1915 massacre of Armenians as "genocide" in interviews. The Armenian Genocide is seen as a process of the systematic extermination of the Armenian population in Turkey begun in 1915 and culminated in 1923. During those years it is believed that up to 1,500,000 Armenians, according to different estimates, died in a period beginning with the Ottoman Empire and continuing in the Republic of Turkey. Erdoğan has repeatedly spoken out against the labelling of the suffering of Armenians during this period as "genocide," particularly around the April 2015 centenary. Before the arrival of the Turkish President to Argentina, the country's Armenian community held a demonstration in front of the residence of the Turkish Ambassador on Nov. 26. Every time any country speaks of Armenian Genocide, the president of Turkey ErDOGan foams at the mouth and his loyal dogs starts the harassment of Armenians in Turkey. What a lame scoundrel!!!! Turkish-Armenian MP Garo Paylan, representing the pro-Kurdish Peoples' Democratic Party (HDP), took to Twitter to respond to remarks about the Armenia Genocide made by Turkish President Erdoghan’s spokesperson. Turkey on Wednesday hit out at French President Emmanuel Macron's announcement that France would make April 24 a national day of commemoration of the Armenian Genocide. "We condemn and reject attempts by Macron, who is afflicted by political problems in his own country, to try and save the day by turning historical events into a political matter," Turkish presidential spokesman Ibrahim Kalin said in a statement after the French leader's announcement on Tuesday. “Turkey is yet to face and name the tragedy of the Armenian people displaced and slaughtered by the decision of the state. What happened should concern first the president and the Speaker of Turkish parliament. They should face and call the tragedy with a proper name as we have been waiting for justice for104 years,” Paylan wrote in a separate post. To remind, speaking to the Armenian community at a dinner in Paris, Macron said: "France is, first and foremost, the country that knows how to look history in the face, which was among the first to denounce the killing of the Armenian people, which in 1915 named genocide for what it was, which in 2001 after a long struggle recognized it in law." They are back at their usual ways!!!!!!!!! Could also be baboonjanis!!!!! New case of vandalism has been found on the walls of the Armenian Surb Astvatsatsin Church in Istanbul’s Zeinlink district, according to a report by ermenihaber.am. The spray-painted graffiti captured by the photographer of the news outlet is signed “OHB” which is one of the most active graffiti makers in Istanbul. This is not the first incident, in which Armenian institutions have been the target of graffiti and vandalism in Istanbul in recent years. In April 2018 photos of graffiti reading “This homeland is ours” spray-painted on the exterior wall of the Armenian Surp Takavor Church and a pile of trash dumped in front of the church’s door began circulating on social media and various Turkish news outlets. The Kadıkoy Municipality condemned the incident as a “racist attack” in a Twitter post, saying the necessary work has been initiated to clear the writing and remove the trash. In 2016, the exterior walls of the Bomonti Mkhitarian Armenian School of Istanbul were vandalized with anti-Armenian graffiti recently. 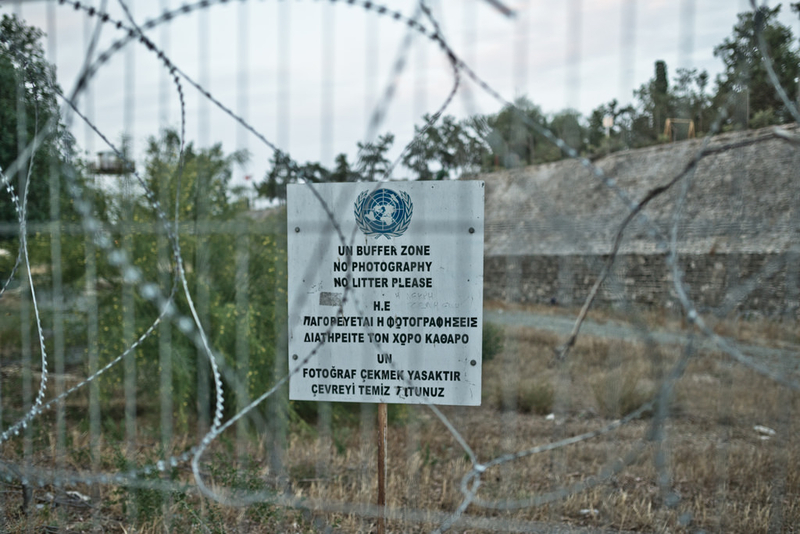 “One night, we suddenly will be in Karabakh,” read the graffiti in Turkish. The Austrian Interior Ministry has banned several extremist symbols including those from Turkish ultra-nationalists and the Muslim Brotherhood. Breibart – In total 13 flags and symbols fall under the new ban including the neo-fascist Grey Wolves from Turkey, the Kurdistan Worker’s Party (PKK), and the Muslim Brotherhood which originates in Egypt, Kronen Zeitung reports. The ban, which comes into effect on March 1st, extends to anyone displaying the flags or symbols in public and subjects them to a fine of up to 4,000 euros and up to 10,000 euros for repeat offenders. The plan to ban the symbols was a joint effort between the two parties of the ruling conservative-populist coalition of the Austrian People’s Party (ÖVP) and the Austrian Freedom Party (FPÖ) and comes after extremist symbols of Islamic State and the Al-Qaeda were previously banned. Exemptions to the ban will apply for those not using the symbols to endorse the groups they represent including use for media, films, exhibitions, and academic use. 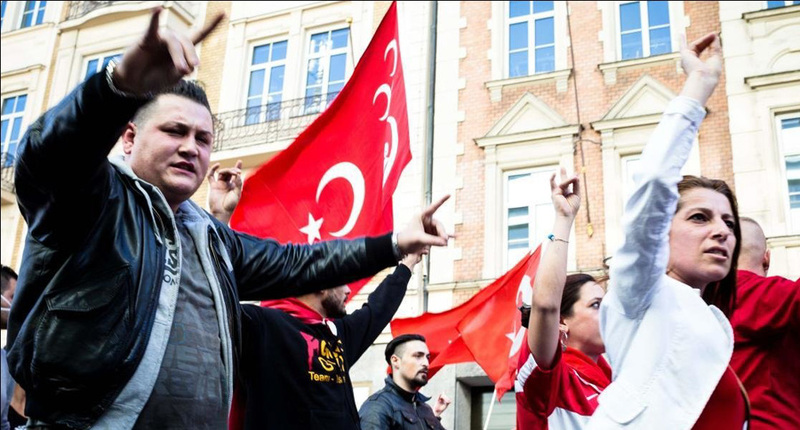 While the Grey Wolves have a much bigger presence in neighbouring Germany, Austria has seen clashes between members of the Turkish ultra-right and the country’s Kurdish community as recently as August of 2016 when the two groups attacked each other in the middle of Vienna forcing tourists to flee into nearby shops to escape the violence. The PKK, while not a major force in Austria, has been allegedly linked to the firebombing of Turkish mosques in Germany. The group is recognised as a terrorist organisation by the UK.